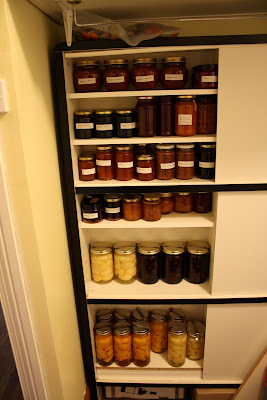 Here is the jam packed jam cupboard, after a busy, busy March. We've apricot, blackcurrant, cherry, raspberry and plum jams along with preserved peaches, cherries and nectarines. Phew! A lot of the fruit we picked ourselves which is all the more satisfying. The laundry is crowded with boxes of potatoes from our garden, which should keep for a few months over autumn. And the kitchen is crammed with baskets of quinces, crab apples, pears and apples still to poach, jam or jelly. There are bags of hazelnuts to crack, sloes for gin and damsons simmering on the stove for more jam, these collected from a lovely friend's wonderful garden yesterday. The fire is gently flickering away and the bread dough is rising on the mantle piece. My little guy is sound asleep on the sofa, tucked under a mohair blanket. Sigh, so cozy. Here I sit with a cup of hot tea, and wonder where the heck did March go? It sure went quickly, and it sure was magical. Thank you so much to pottymouthmama for inviting us to join in the magic. Wowza that is an impressive stash!! Should see you through winter - methinks there will be some delicious warming snacks served up over there. Your amazing, look at all that jared yumminess. Oh WOW I should have read this post before I sent that last email....what a great collection of goodness, and so organised! That is the most impressive cupboard of home made goodies I've ever seen. How wonderful, and it is so much nicer to have picked it all or at least to know where it all came from. such an inspiration as i journey into my growing season. we still have jam but ran out of applesauce months ago. it sounds like your in-between season is off to a lovely and cozy start. Very nice! A lot of work has gone into that stash- now you can enjoy it. what an amazing post. you painted such a beautiful, cosy picture in my mind. i'm coming over for jam toast...ok? wow WOW wow it looks like an exert from a Martha Stewart magazine. How is it your pantry is darn neat and beautiful. Careful! A bunch of us will want to move in with you and eat all of the wonderful foods and preserves you've gathered and created! ;) I'm kidding, of course. It all sounds lovely! what a collections. sounds delicious. woah, that is way impressive!